One morning, Jamie Kruger and Jordan Thaler’s classroom quietly transformed. 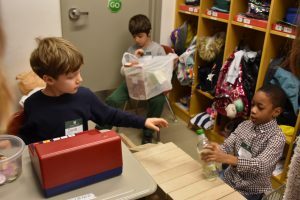 The cubbies became a checkout line complete with cash register, the teacher’s desk turned into a fruit stand, and desks were pushed together to create a sushi station. And it was then that the Room 217 Supermarket – as students officially named it – was open for business. Students handed out bags of tokens, the monetary system accepted by the mart, to “customers” (aka faculty and staff) upon entering. So what does a supermarket have to do with education? As it turns out, a lot. What looks like a fun project (and is) is an example of Project-Based Learning. According to Amy Mayer, CEO of friEdTechnology, “In project-based learning, the projects only serve as an infrastructure to allow users to play, experiment, use simulations, address authentic issues, and work with relevant peers and community members in pursuit of knowledge.” Project-Based Learning can be even more important for students with learning differences. The class started the project with research, visiting a neighborhood grocery store to take notes of the layout as well as prices of items. Next, students collected clean containers from home to use as merchandise for their supermarket. Then, they decided on sections of their store, such as dairy products and cereals, organizing the goods accordingly. 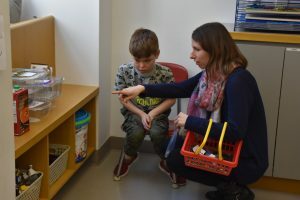 The supermarket incorporated all major subject areas including reading, mathematics, writing, social-emotional learning, research, and social studies. And perhaps most critically, by undertaking such a large and collaborative project, executive functioning skills.